Hostas are easy-to-grow perennial plants that come in various sizes, colors, shapes and textures. The shade-loving hostas are prized for their foliage, adding interest to areas under trees. They are easy to maintain and have around 2,500 varieties to choose from. Hostas are originally from Japan, China and Korea, and were brought to Europe in the late 1700s and ultimately to the U.S. in the middle 1800s. The leaves may be blue, green, golden or yellow, depending on the variety. Some types change their colors according to seasons. Hostas with blue leaves do well in shade, while plants with gold, yellow and white leaves can do well in the sun. They grow best in well-drained, slightly acidic soils, rich in organic matter and high in nutrients. Sum and Substance is about 2 1/2 feet tall and 5 feet wide with glossy leaves. The leaves of Sum and Substance grow upright and change their color to gold with more exposure to sun. It produces white bell-shaped flowers in August. It is a pest-resistant variety. Pauls’ Glory has yellow leaves with blue-green margins. The leaf color is chartreuse in May, changes to bright gold by mid-July and with more sun, the gold color lightens. The margin is blue-green in June and becomes dark green in mid-July. The flowers are white and bell shaped. Paul's Glory grows 2 feet tall and 5 feet wide. Gold Standard hosta grows vigorously has gold-colored leaves with dark green margins. The flowers are pale lavender and bloom from mid-July to mid-August. They grow up to 18 inches high and 3 feet wide. The leaves Great Expectations hosta have good substance and are round and puckered. The leaves are light yellow-cream bordered by a large, irregular blue and green margin. In summer, Great Expectations produces a mass of dense, white flowers. These hostas are about 2 1/2 feet tall and 5 feet wide. 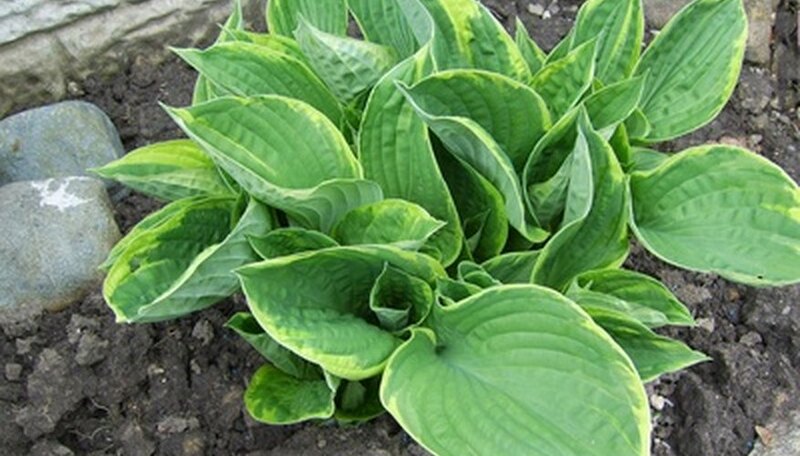 Sagae is a 3-foot-tall, 6-foot-wide hosta that has large, thick textured leaves. The leaves are chalky blue-green in color with gold margins. This plant produces violet flowers. Patriot hostas are 2 feet tall and 4 feet wide. The small leaves are green in color with bold white margins. The margin color changes from creamy yellow in May to white in the growing season. June hostas are slightly more than 1 foot tall and 3 feet wide, with 6-inch-long leaves that are gold in color with blue-green margin. This plant has thick leaves.